Discussion in 'Science & Society' started by wet1, Aug 13, 2001. Researchers in Asia say a cheap and simple water pump can help farmers to escape poverty. The device, a treadle pump, is foot-operated, and ideal for farmers who cannot afford to run a diesel pump. It gives them access to groundwater for irrigation, and the prospect of higher yields. It is being launched on Monday in Stockholm, at the World Water Symposium, one of a series of meetings on what many scientists believe is an impending global water crisis. The pump's potential will be explored by a coalition launched to resolve the dilemma of increasing water scarcity. The coalition, the Dialogue on Water, Food and Environment (DWFE), brings together scientists and policymakers. Its job is to reconcile the demands of producing food and protecting the environment. Agricultural scientists say farm water use, especially irrigation, must increase by 15-20% in the next quarter century to feed the world's growing population. But environmental scientists say water use will need to fall by at least 10% to protect rivers, lakes and wetlands, and to meet the demands of cities and industry. About 450 million people in 29 countries already face water shortages. The International Water Management Institute (IWMI) says about 2.7 billion people, nearly a third of the world's probable population by then, will by 2025 live in regions facing severe water scarcity. But an IWMI study into the use of treadle pumps suggests they can be an important part of the answer to conflicting demands. The pumps allow farmers to make sustainable use of an existing source of water, and to grow more food and become richer in doing so. The study evaluated the use of treadle pumps in eastern India, Nepal and Bangladesh, where 400 million of the world's poorest people live. So here we have the direct opposites. One needs more water in the field and the other needs to conserve water. Which do you favor and why? I do not think there is a water shortage per se. The shortage is drinking water. And when there is no rain for a while, the water table drops. 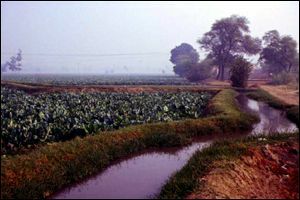 People depending on ponds and rain for irrigation have problems. Even in Louisiana, we are losing good quality drinking water faster than we can replenish via the weather. The solution in both cases is water management so that we do not create a lot of waste water beyond what can be reclaimed. In Utah, we use non drinking water for lawn and irrigation. In east india, waste water treatment facilities are rare (except in big cities). When there is a major flood, most of the water gets contaminated. A lot can be learned from Israelis who have learned to manage use of water extremely well to produce food. In Louisana the is a large aquifier (I forgot the name) which has been protected as the single most important source of drinking water for the populace. But there is a conflict. There is a manufacturer who wants to set up shop and needs a large volume source of water. Guess where he wants to get it from? At present they are petitioning to set up hearings to try and secure the license to obtain such. Want to make any guesses how long the water supply will last after such would be issued? Sooner or later the runoffs either make it to the ocean or to the aquifiers. Without rain the aquifiers do not fill either and they have been in decline with the drought we have had the last couple of years. This year looks so far to be wetter than the previous ones. But it will take several to bring the water back to near normal levels. Average household consumption from well = 10,000 gal X 12 = 120,000 gallons per year. Assume the well user land at 1 acre with 60 inches of rain per year. Total rain fall on the property = 1,629,361 gallons per year. Maybe the people should levy the government for allowing so much excess rain to fall. Makes as much sense.